Once Reiter's Thyme gets established, it makes a gorgeous display of flowers in the spring (as you can see in the beautiful backyard above). The flowers drop off after a while and the thyme continues on its creeping way providing a lush ground cover. 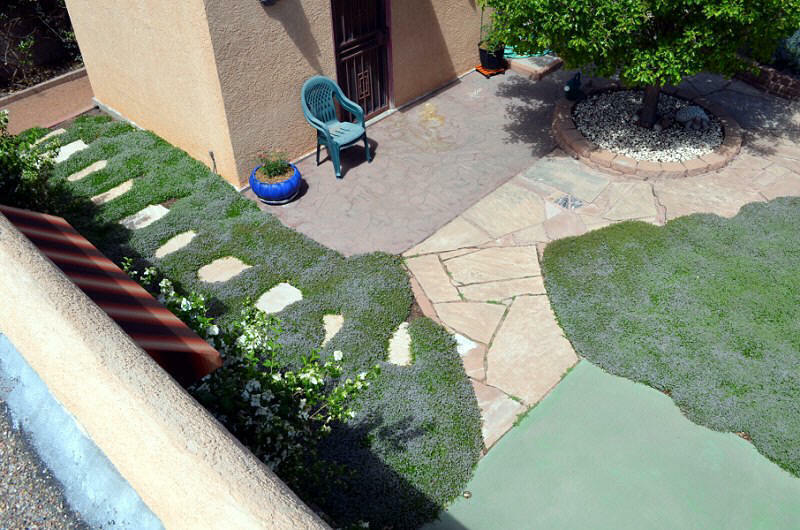 Ground cover thymes can take foot traffic as long as it is not repetitive enough to wear off its leaves. The long spaces or stem segments between these leaves are what help Reiter's Thyme to be one of the more aggressive creeping thymes. The longer the space between leaves the faster the thyme covers the ground. Given moist ground to creep on, these stems will set roots into the soil, effectively making a new plant. 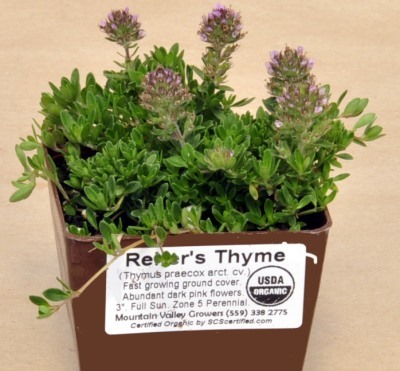 Reiter's Thyme is often included in our 36 Pack Alternative Lawn Assortments. This plant is often available in plug trays. These trays hold 128 of all the same plant. They are a great low cost way to fill a lot of space. Each cell is 3/4 of inch by an inch. Check here to see if Reiter's Thyme Plug Trays are available.